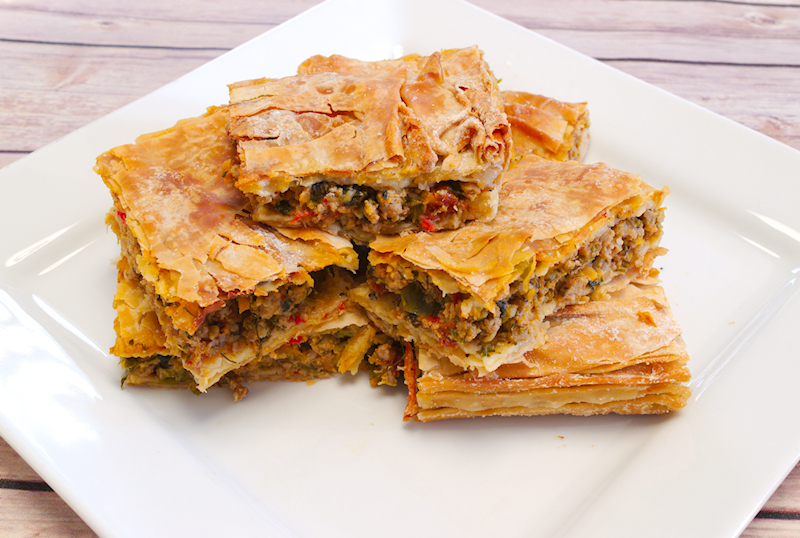 A recipe for delicious spicy turkey pie with peppers and herbs. 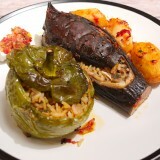 A healthy option for everyday lunch or a starter. My obsession with pies is quite obvious from my posts during the last 18 months. 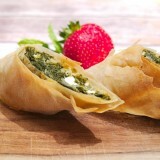 Doesn’t matter if it’s a vegetarian (like Spanakopita) or meaty one, I just love the taste of something being sandwiched in filo pastry. The passion of Greeks for pies is difficult to describe. There is a pie in almost every table that you’re invited to sit in. They make pies with everything. Even wild greens found in the mountains or in their garden. Or with what was left from the previous day. Everything goes! I guess this habit or tradition comes from the years that Greece was a poor country (even poorer than now, if you can believe it) and people had to feed themselves and their families with cheap ingredients that were easy to find. Add a couple of eggs, make the pastry with flour and water and…voila! The whole family is fed. This spicy turkey pie is not only easy to make but will also save you from making lunch for a couple of days. It’s quite healthy and nutritious and can please anyone. I used mince turkey thighs as they have much more taste than the turkey breast. If you are after an even healthier option, you can use turkey breast of course. 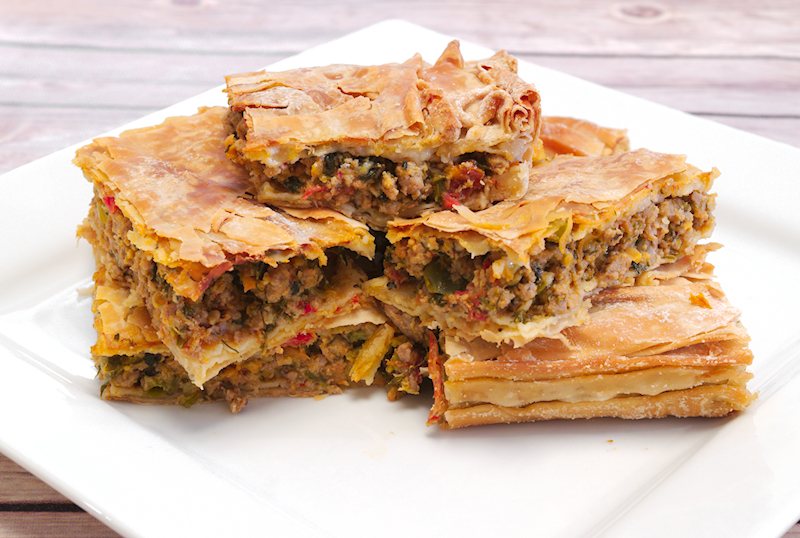 The big difference in every pie is made by the right filo that you are using. Let’s face it, the ones you find in the supermarkets can do the job but they are far from…amazing. Puff pastry can be an option and may be is better suited for this kind of pie. 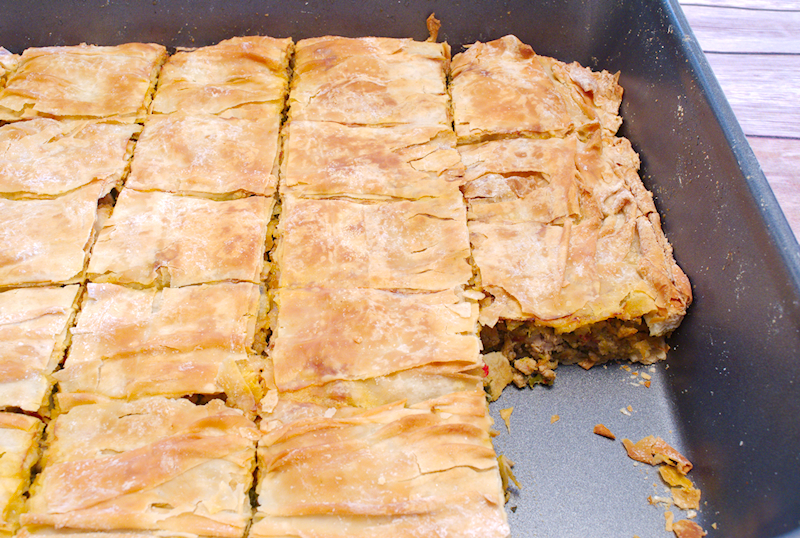 Here, I…cheated as I had some traditional filo pastry that I bought in Greece. It’s so great that I fill one suitcase with it whenever I visit Greece! 1 kg (35 oz) mince turkey thigh. 3-4 medium tomatoes cut in cubes. 1 ½ teaspoon chili powder. A generous pinch of of dried oregano. A pinch of dried thyme. Add 3-4 tablespoons of olive oil in a large frying pan or pot on medium heat. Add the onions and pepper and cook for 2-3 minutes until they start getting soft. 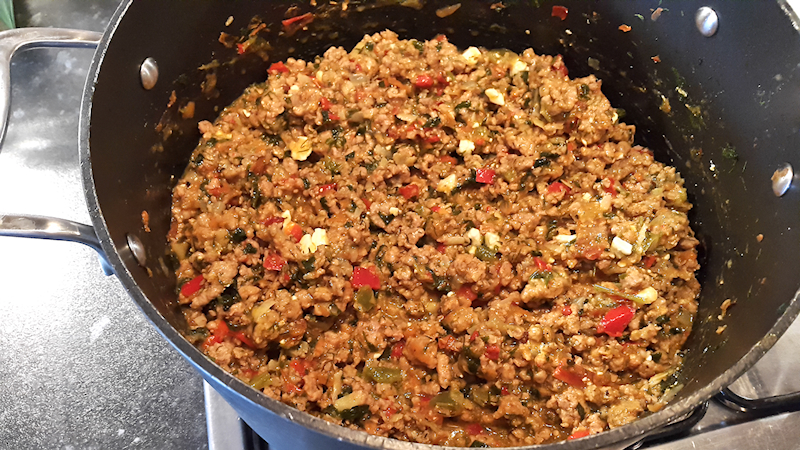 Add the mince turkey, the oregano, thyme, chili pepper and season with salt and pepper. Give a good stir and brown well the turkey. When the juices start to reduce, add the wine and cook for a few minutes until the alcohol evaporates. Add the carrots, parsley, dill and sundried tomatoes, stir well and let it cook for ~ 10 minutes. Give it a stir occasionally and try to see if it needs more seasoning. Remove from the heat and let the mixture cool for ~ 20 minutes. 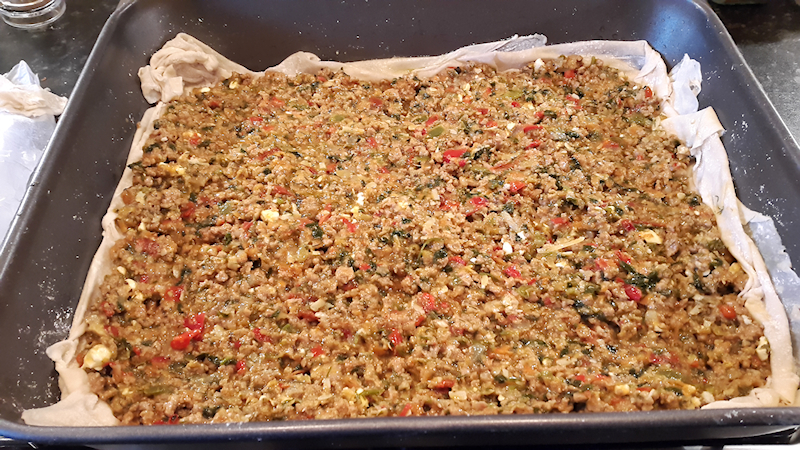 When the mixture has cooled down, add the Feta and egg and stir well. Preheat the oven at 180 degrees Celsius (360F). Cover the bottom and walls of a medium-large tray with olive oil using a kitchen brush. 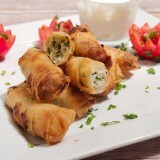 Lay one filo sheet on the bottom and spread some more olive oil. Lay the second sheet, spread some more olive oil and add the third sheet. Add the turkey mixture in the tray and spread it to have an even surface. 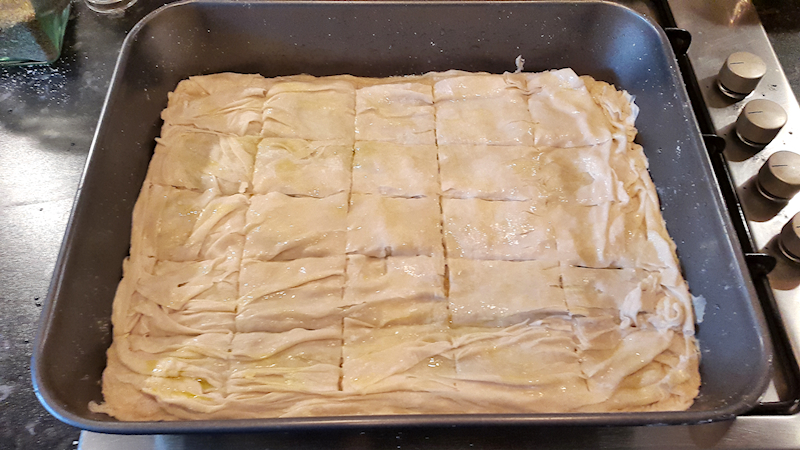 Add a filo sheet on top, spread some olive oil and repeat with the rest of the sheets. Fold the sheets to make sure the mixture does not leak during cooking. Spread some more olive oil on top of the pie and some water using your hand. Use a knife and cut the pieces you are going to serve the pie making sure that you don't reach the bottom. Put the turkey pie in the oven and bake for ~ 45 minutes until golden brown. Before you cut it, let it rest for 10-15 minutes.